On september 2018 Vinicola San Nazaro got the certification under the standard UNI EN ISO 22.000, food security, certificate IT285192, by Bureau Veritas. Vinicola San Nazaro offers different types of packaging and transport means to deliver its products. They may be dispatched and delivered by tractors, tankers, trucks, containers, trains and ships, always in accordance with our customers’ requests. We offer transport by tanker throughout Italy and our tankers have a capacity ranging from 5,000 to 31,000 kilos. We may also employ external road haulage contractors to guarantee deliveries throughout Italy and abroad. In 2013 we started to employ haulage contractors using isobaric tanks, which ensure qualified, secure transport for our sparkling products . Our containers can carry up to 60-80 aseptic drums placed on pallets. They can also be refrigerated (reefers) to carry goods at constant, controlled temperature. 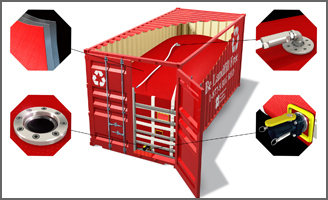 Flexitank is a flexible container installed on a 20-feet sea container. It is used for the transport of non-hazardous liquids all over the world with a significant cost reduction compared to steel tanks. Our products can also be packaged in containers of different capacity ranging from 200 to 24,000 kilos. Aseptic filling is possible. Our products can be transported in semi-rigid plastic containers with a capacity up to 1,350 kilos. Suitable for direct contact with food. galvanized steel tube frame (18 x 18 mm) with protective shields and plate marking. Semi-aseptic filling. The sterilized product (about 1350 kg per IBC) is packed directly into the small tank and tightly closed and sealed. Our products, mainly concentrated and/or rectified musts, may be packaged in metal or plastic aseptic drums with a capacity up to 280 kilos. This operation is carried out in aseptic atmosphere and with aseptic materials to guarantee the non-deterioration of the chemical, physical characteristics of our products in long-haul transports. Products are not in direct contact with the drum because they are inside sterile bags. Movable cover in black with natural rubber gasket. Clasp closure galvanized steel. Drumming aseptically. The sterilized product (about 270-280 Kg.per stem) is packed in a polythene bag in a 220 liter capacity and hermetically sealed in the drum.